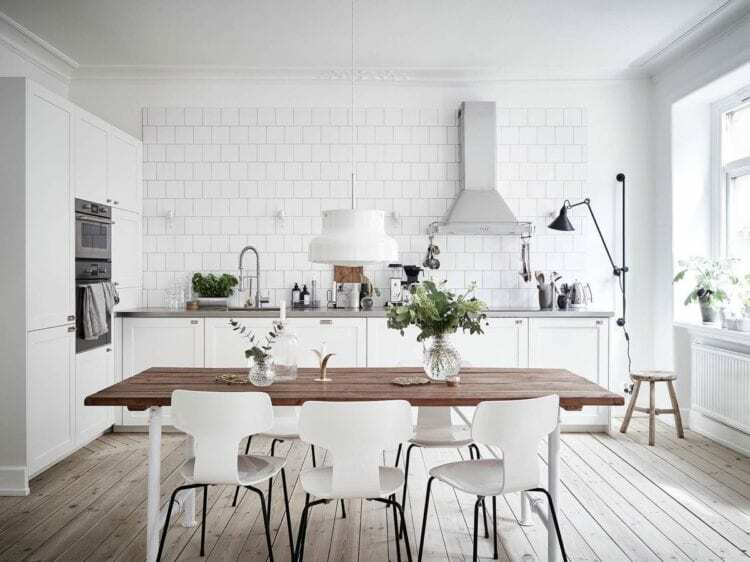 FeastHome – Scandinavian style often appears in strong white accents that cover the whole room. It almost looks like a monochrome style with a minimalist combination. 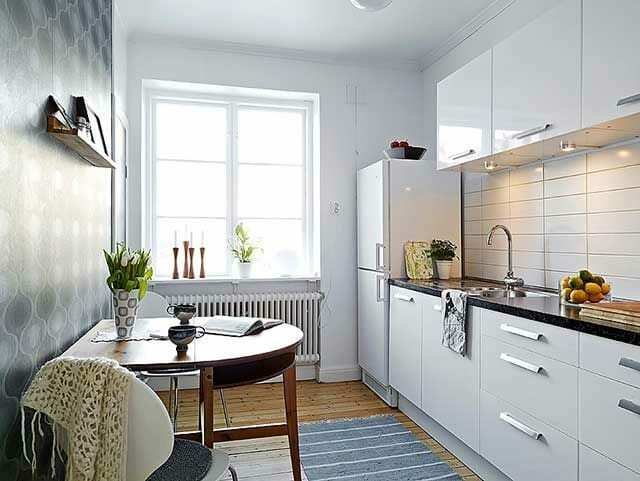 Nordic kitchen style ideas are stated to have sleek lines, bright surfaces, and simplicity. 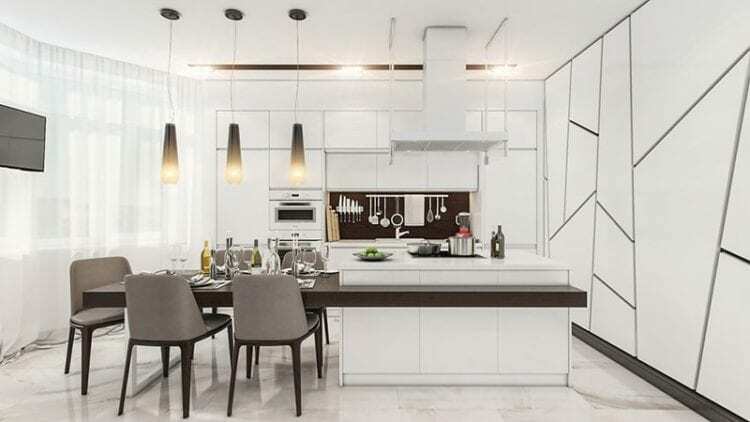 Offering a simple and efficient look, this style fits for you who are not very keen on having too many stuff in your home, especially in the kitchen. Bright space is very identical to Scandinavian style since it’s infused with white hues from the walls, ceiling, and furniture. This kitchen has a simple terracotta tile wall, but it looks so alive with clean and bright color. A subtle warm touch comes from the wooden panel floor and table. There’s a simple way to increase efficiency in the kitchen. Limiting unnecessary stuff is advised if you’re not very fond of seeing the kitchen in a mess. This can be applied for you who needs to see everything is under control – you want everything to look clean, neat and well-arranged. Dealing with a cramped space can be tiresome since it won’t allow you to put fancy, big things in it. But with a little trick, you’re still able to make a way out of it. Shaping an island to appear long and thin is probably the most make sense thing to do in this case. The benefits will be that you can manage to save some space by tucking in the stools underneath. You don’t have to feel troubled when tackling a tiny space. In fact, many people face the same problem as you do. Creating open shelves on the wall will solve your problem. 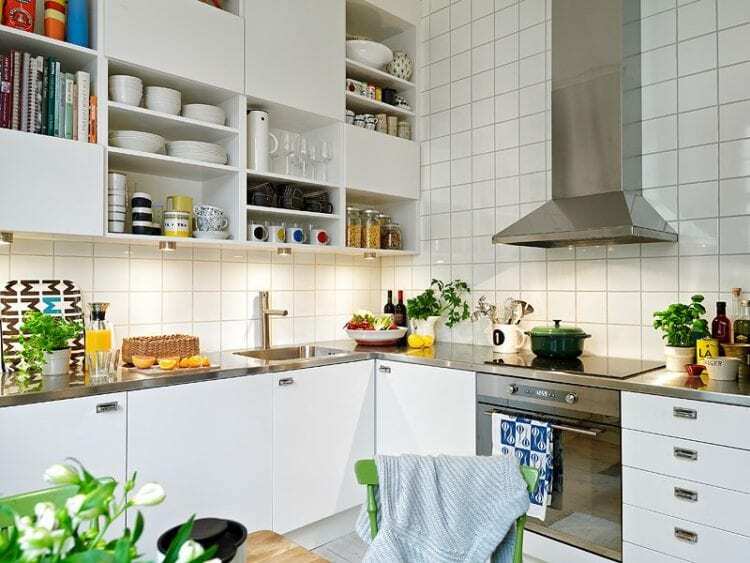 The benefits of having open shelves are you can easily spot things and can maximize the use of space. If you want to be able to eat your meals while enjoying the view outside, you can set a table right in front of the window. 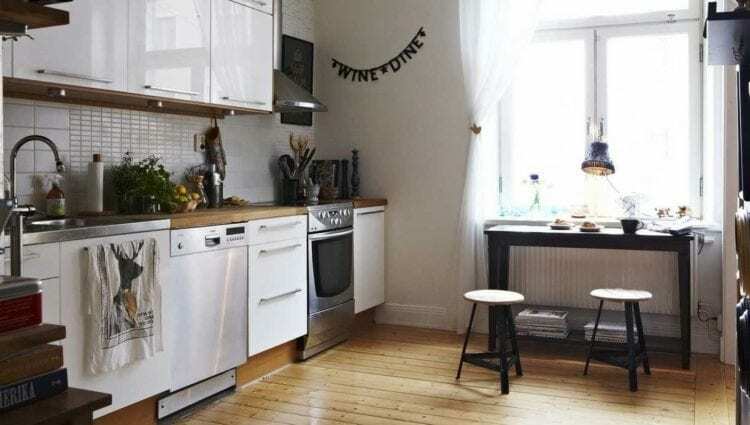 Another advantage will be to have some more space left in front of the cabinet, which makes your tiny kitchen appear visually larger. 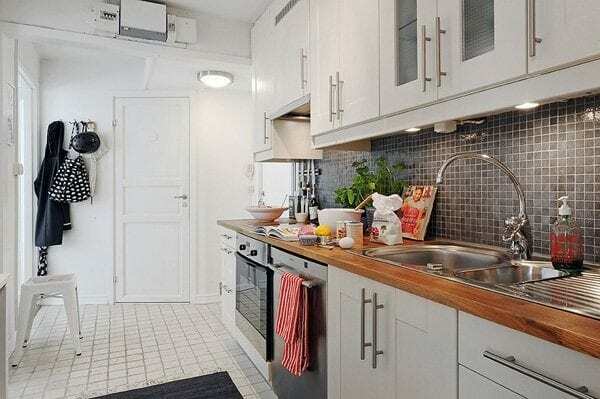 Infusing dark color in a Scandinavian kitchen style can really create a strong contrast. It’s due to two colors that have the opposite effect. The dark kitchen cabinet gives a bold accent that looks so intimidating, but pleasing. Wooden panel, stone or terracotta flooring tiles are quite often found in many homes with different styles. 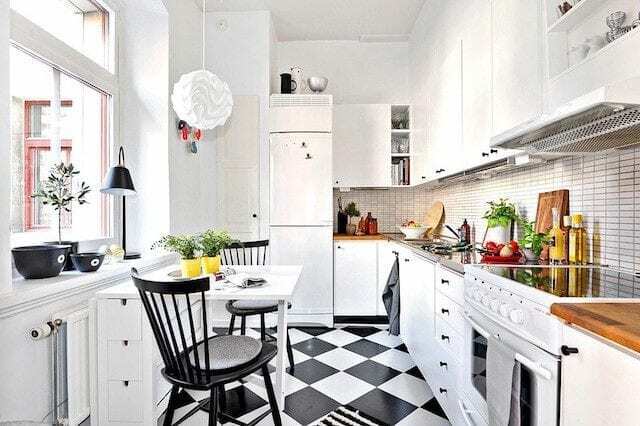 This Nordic kitchen idea adopts a black and white tile for its flooring. Terracotta tile wall with blue line smoothly gives a cool touch in the kitchen while a bunch of beautiful flowers adorns the environment to some extent. A clean area is must and that’s not only for the kitchen but for any other rooms in your home too. 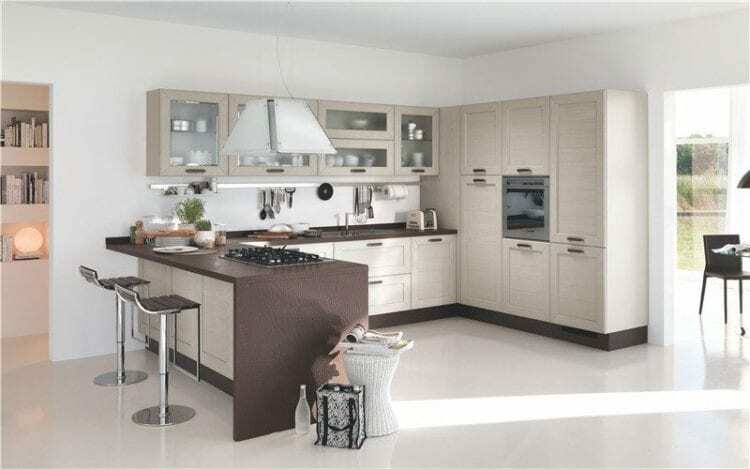 In this kitchen, you can see that clean surfaces create a happy feeling that makes you feel at home in being here. A hygienic place can also increase your appetite and guarantee that the served meals are fresh and delicious as well. 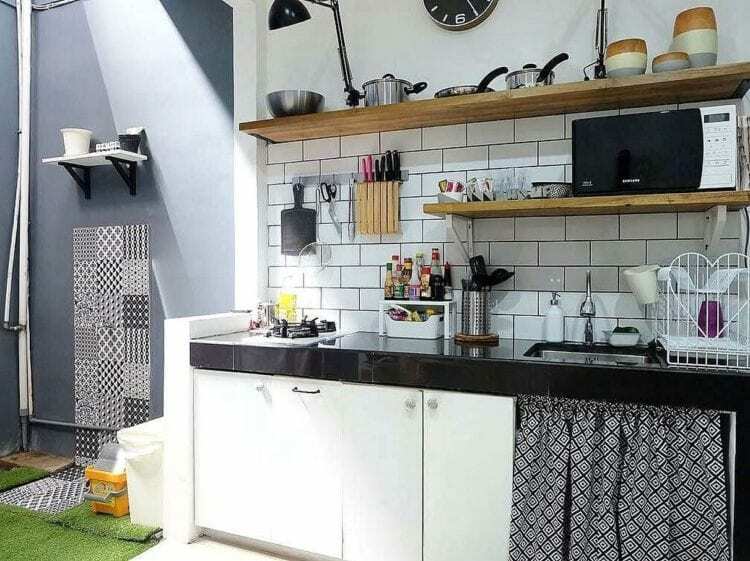 When you feel like decorating your wall in the kitchen, there are some ingenious methods you can apply. Giving the wall a nice pattern, floral or with a mosaic tile is a wide range of choices you pick. 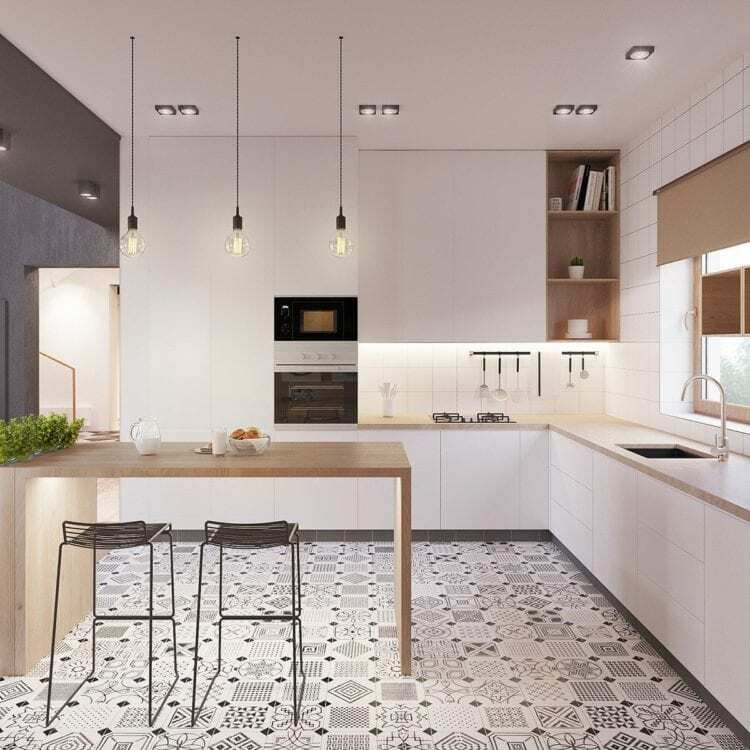 A mosaic wall brings an artsy look to your kitchen that perhaps what encourages people to apply it in their homes or kitchens. 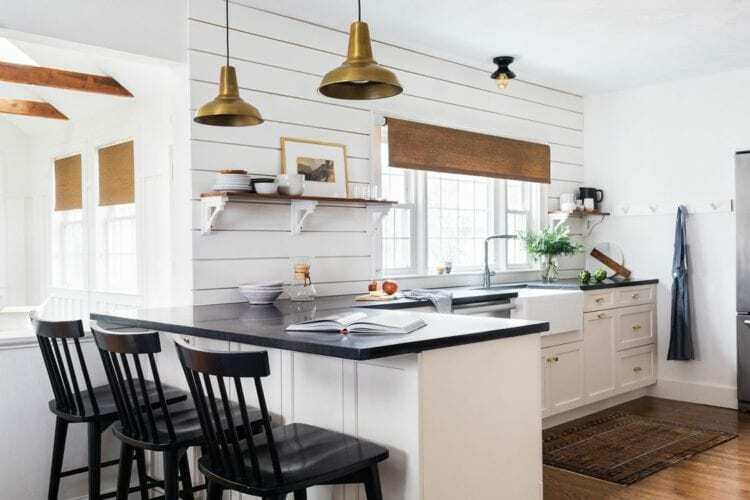 Often taken for granted, a rug can actually give a warm and welcoming feeling into the kitchen that you can combine it with any kitchen ideas. The wall seems to have a nice pattern with the grey hue that merged with Nordic Style. And the semi-circular table fits with small space. 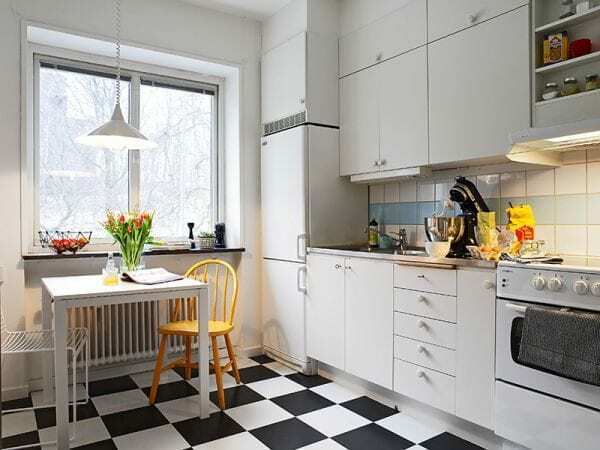 The idea of having the table is to save some space because the kitchen is fairly small. Letting some fresh air flow through mightn’t be the first thought on your item list to be included when designing a kitchen. You’ll realize how important it is when comparing to one with poor air circulation. Notice that a dark element is mixed in this packed kitchen leaving a sense of classy touch. And the flooring looks astonishing due to its unique arrangement. Nordic style isn’t just about bricks and terracotta walls. Decorating the wall with a paneling wood to bring a rustic feel is highly recommended. With the right execution, you can have an awe-inspiring kitchen as a result. What a clever way to have a countertop that can be used as a table at the same time. It also has a deep overhang that allows you to store the chairs underneath. 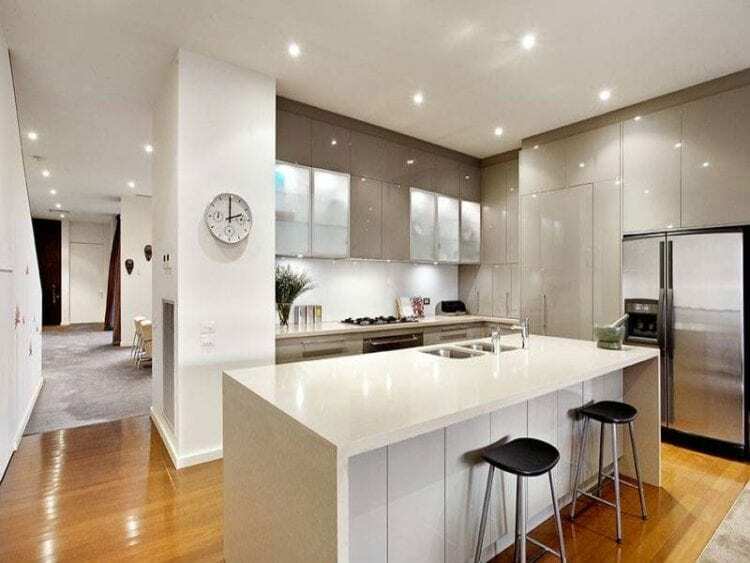 To get a fabulous kitchen look can be accomplished by many things, one of which is to install glossy surfaces. 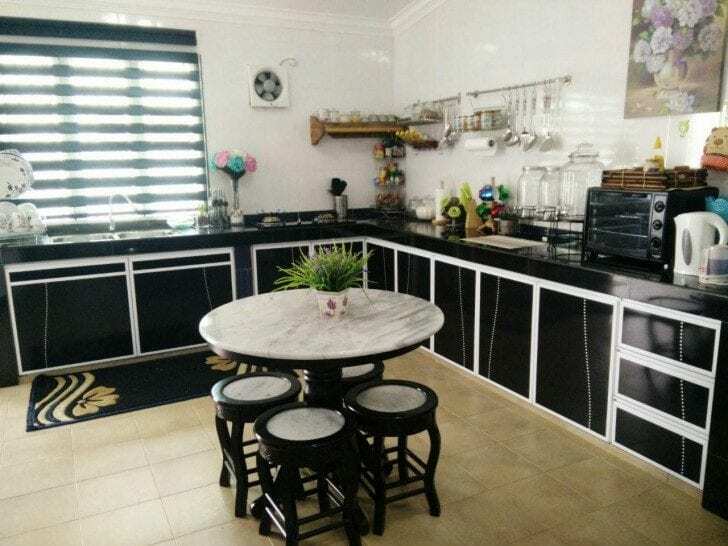 Not only the floor, but the island and cabinets look so mesmerizing. The wooden floor brings a strong welcoming ambiance and looks so clean that you can see yourself on the surface. If you love to be punctual, putting a clock on the wall can remind you about the time so that you can do your work right on time. A cool place is where you’re able to relax and calm yourself down to rejoice your current mood. Baby blue can be a smart choice that you can use in order to create a relaxed atmosphere in the kitchen. Another element that can support that is to remove any unnecessary items or stuff in the kitchen. There is only a little stuff in here and that makes it look uncluttered-free just as what you need. Expanding your idea and creativity can result in such striking work. This outstanding flooring tile proves it to you. 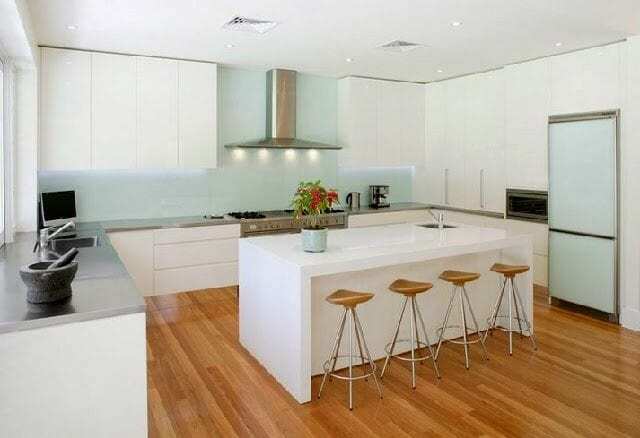 It can strongly be felt that this kitchen screams a minimalist touch that you can obviously sense. The white accents combined with hanging light bulbs speak how crisp the appearance is. You shouldn’t forget that lighting is a vital element in the kitchen. it can either enhance or break the current look if poorly designed. 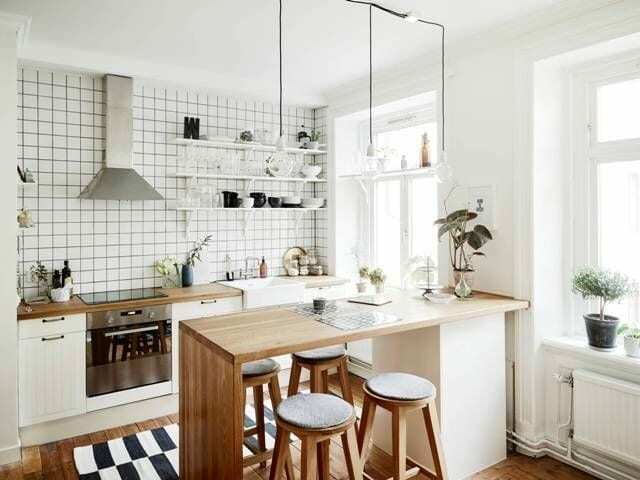 With a distinctive pattern, the wall is something that’ll catch your attention among other things in this exceptional Nordic kitchen design. A simple design can be special. You can pay full attention to other things rather than the appearance. You can focus on how to increase the efficiency that can support your daily tasks in the kitchen especially when you’re in a hurry. 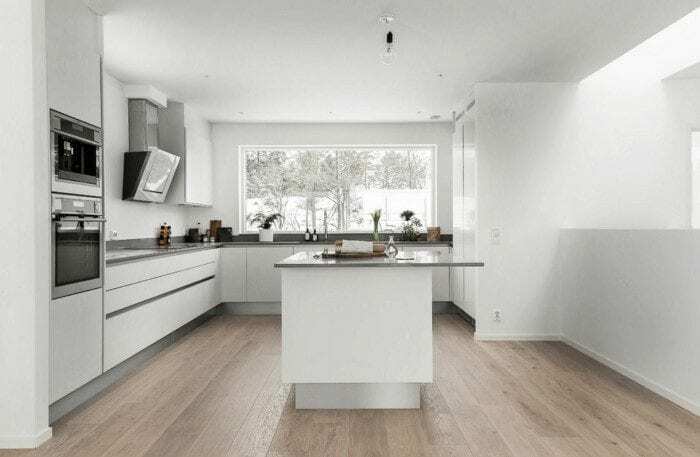 Nordic kitchen style offers you an efficient environment with a simple design, but it still encourages you to have a delightful look at once.